November is upon us! The pumpkin spice lattes have been swapped out with red cups. It is now finally time to break out the sweaters from the back of your closets, and Santa has already arrived at shopping malls. It’s technically not the first Thursday of the month, but y’all get the gist. 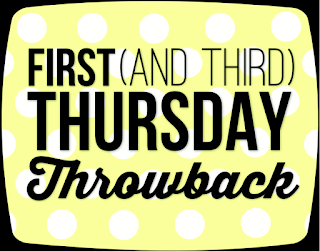 We have another installment of our #ThrowbackThursday series. This week I (Maddie) got to talk to the lovely Laura about her nostalgic faves. Enjoy! A: If we’re truly talking first TV obsession, then I’m going to have to throw way back to Rugrats. Seriously, I had a Rugrats lampshade and Rugrats wallpaper in my bedroom, even from a young age I took my TV obsessions very seriously. To this day, my family and I will still reference and quote this iconic show (the dog groomer will forever be known as the dog broomer in our household). I’m not sure if Rugrats had much of an impact on my taste in TV going forward but it was the first show that taught me it’s okay to watch the same episodes over and over again. A: I must have been a weird kid because I don’t remember ever being THAT into Disney. I still have never seen Mulan which many people tell me is a crime. Instead, I was big on musicals growing up. While I might not have known any of the words to “I’ll Make a Man Out of You,” I could (and still do) sing “Gee Officer Krupke” like a pro. I was fairly obsessed with Lady and the Tramp though and still own it on VHS. I dare you to find a more romantic moment in a Disney movie than Lady and Tramp sharing a plate of spaghetti with each other. Q: Favorite nostalgic TV theme song? A: Gilmore Girls. If you can listen to that theme song and not immediately start singing along, then you must have very serious amounts of willpower because that is something I just can’t do. A: No doubt about this one: Community definitely brought me into the nerdier side of pop culture. It introduced me to LiveJournal, where I lurked for years, as well as Twitter which is pretty much the main way I access that nerdy side nowadays. Before Community, I still considered myself a TV fanatic but I wouldn’t actively seek out news and articles about shows, much less bother looking up ratings after each new episode. A: Again, I must not have been normal because I never really had a “TV boyfriend.” Did I want to see Lizzie and Gordo get together on Lizzie McGuire? Of course! But did I want to date Gordo? No way, he needed to be with Lizzie. I will say though that if I could pick one television character to be my boyfriend, it would be Ben Wyatt. That man is literally perfect. A: I discovered Scrubs right around the time that their musical episode (which, by the way, is still the best musical episode of any show) aired and immediately fell in love with the quirky comedy. You can definitely see aspects of Scrubs in other comedies I found myself gravitating towards, like Psych and Community, all three of which contain the best bromances on television. In terms of my own sense of humor, I think it instilled in me a love of sarcasm, deadpan humor, and smart comedy. A: I’ll never forget the first time I watched Gilmore Girls. It was a random episode somewhere in the start of the show's run and there was a diner scene between Luke and Lorelai. Despite being completely platonic, somehow I knew that those two would end up together. As I slowly immersed myself into the beautiful world of Stars Hollow, I began rooting even more for these characters to get together. Somehow, I stumbled upon fanfiction and it was all history from there. A: Although I read fanfiction for Gilmore Girls and read message boards occasionally for other shows, it wasn’t until Community that I became an actual part of the Internet fandom. In a social media class for college, I had to use social media to promote something and I chose to use Twitter to promote Community, which struggled to stay on air. Long story short, I ended up meeting so many amazing fans through Twitter, all of whom were incredibly accepting. Over the years, I’ve had a chance to meet quite a few of them and when I lived in L.A., actually became good friends in real life with people I met through Twitter. It’s amazing to see what fandom can do and what kind of an impact it can have on your life. Q: Was there a fictional character growing up whose style you envied/wanted to emulate? A: I didn’t pay all that much attention to any particular character’s style growing up. But today my fashion idol is definitely Felicity Smoak. Seriously, I want to buy all of her dresses. A: I’ve got to go with what is most likely the most popular answer on this one and say Chandler. While Joey’s lack of intelligence and Phoebe’s quirkiness brought a lot of humor to the show, it was Chandler’s sarcasm and dry humor that never failed to make me laugh. A: Unsurprisingly, the answer to this one is also Community. It was this show that inspired me to write my first spec script and it was Community that inspired me to start actually analyzing shows instead of just being a passive viewer. A: Wait, you’re asking me to pick just one? Okay, I’m going to go out on a limb and say Johnny Tsunami. I don’t know, there was just something really inspiring about watching the surfer turned snowboarder stand up to his bullies and make a name for himself in a new town. Honorable mentions go out to Smart House and Motocrossed. A: Well obviously the answer here has to be the people I’ve met. Everyone is so incredibly supportive of each other in ways that I could never have imagined when I first joined Twitter. Many people are skeptical when I call the people I’ve only talked to on Twitter my friends, but that’s what they are to me. And so many of those Twitter friendships have evolved into real life friendships. I’ve been fortunate enough to meet up with so many of these amazing people and hope to continue to in the future. The main reason I love conventions so much is that it lets me connect with and meet up with some of the wonderful people I’ve met through fandom and I’m never disappointed. Everyone I’ve met is just as delightful in person as they are on the internet and I wouldn’t trade the friendships I’ve made through fandom for anything. A: Parks and Recreation started when I was in high school and continued until I graduated college and as I grew up during that time, one friendship that I really aspired to have was the one between Leslie and Ann. These two women supported each other through anything and everything, no matter how crazy the idea. The friendship between these women was more important than any relationship they had with any passing guy and they never forgot that. Through thick and thin, they were there for each other, both exemplifying what it means to be a strong woman. Who wouldn’t want a friendship like that? A: I’m cheating again and not going with someone from the past. Though there have been many influential female characters on television, the one who has been and continues to be the most influential to me is Felicity Smoak. She’s taught me that you don’t need to wear a costume or physically fight anyone to be a hero. Felicity is a hero because she’s strong, independent, and smart and won’t take crap from anyone. Not even a bow-wielding vigilante. She stands up for what she believes in and is willing to do anything for those that she loves. Felicity is the kind of woman I aspire to be.